Heat oven to 350°. Spray rectangular baking dish, 11x7x1 1/2 inches, with cooking spray. Cook and drain pasta as directed on package. 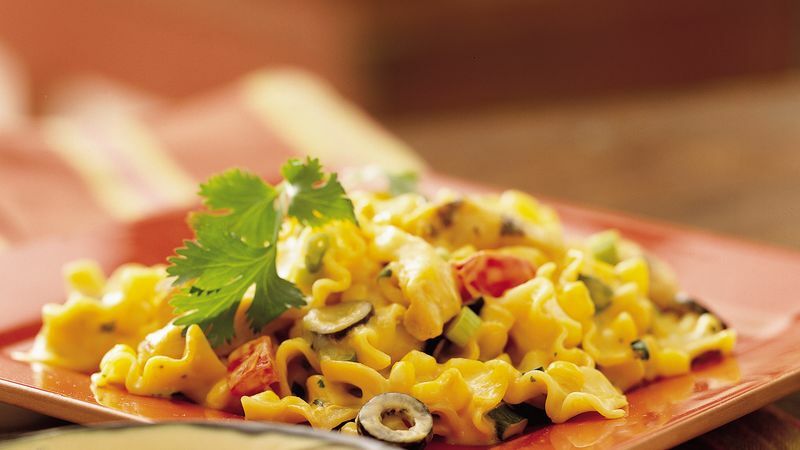 Mix pasta and remaining ingredients except cheese in large bowl. Spoon into baking dish. Cover and bake 45 minutes. Sprinkle with cheese. Bake uncovered 5 to 10 minutes or until cheese is melted and casserole is bubbly. To make ahead, omit the milk and mix uncooked pasta, 1 1/4 cups water and the remaining ingredients (except cheese) in the sprayed dish. Cover tightly and refrigerate at least 8 hours but no longer than 24 hours. Increase the first bake time to 1 hour, then add cheese and bake 5 to 10 minutes longer. Mafalda looks like mini-lasagna noodles and can come in long ribbons or short pieces. Use the short variety for this recipe. If you don't have mafalda on hand, you can use another pasta of a similar size, such as gemelli, rotini or mostaccioli.